PaceAutomotive Body Repairs Ltd - Garage/Vehicle Services based in Colchester, Essex. COLCHESTER'S FIVE STAR BODY REPAIR SHOP WE CAN NOW OFFER 0% INTEREST REPAYMENT PLANS ON VEHICLE UPGRADES/REPAIRS!! State of the art Service bumper and collision repair! 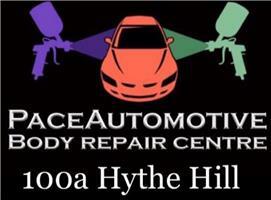 We are a locally owned Body Repair Center that proudly serves the Colchester area. We are a full service Repair, Collision and Paint repair center that uses the latest tools and techniques to ensure your repairs are done right. Bumper Repair & Vehicle Body Services Done Right! At PaceAutomotive Body Repair, we are committed to earn your business by making you the customer our Priority. We pride ourselves as having quick response times, a very courteous staff, and exceptional rates. We provide vehicle body collision repair and painting services for all makes and models including imports. All of our technicians participate in ongoing training sessions throughout the year. We use computerised paint mixing system for perfect colour matching, and the finest and the highest quality Paint. We are committed to providing extremely high quality services no matter how extensive or minimal the job is.